To sum this poster up in a paragraph in the most explosive and easily understandable way. "Over 500+ of the most powerful people in Asian MMA will be invited to this all-expenses-paid mega summit to create the future together. Keynote speakers will include the top CEOs from media companies, blue chip sponsors, domestic MMA promotions, the best MMA gyms, and much more. "- OneFC Facebook. 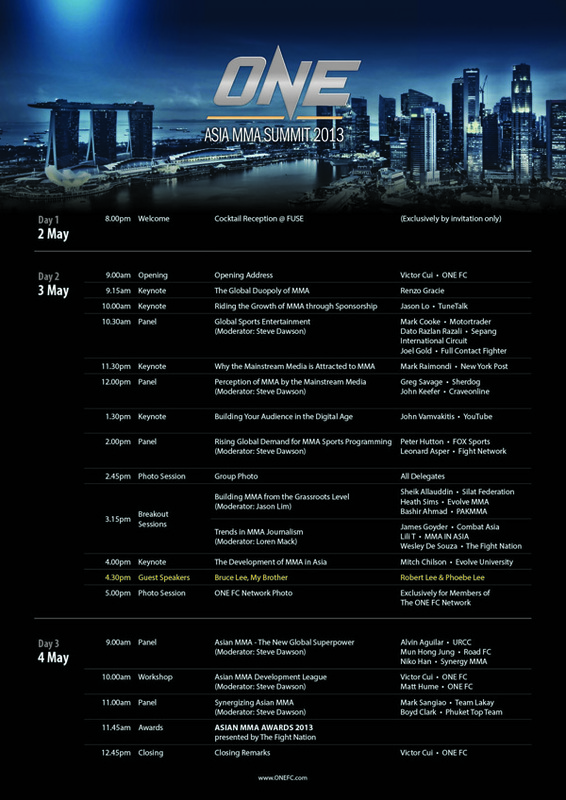 A conference that will be gathering the best people talking about Asian MMA and the potential future it holds for marketing, monetary, entertainment, and personal values.I will be expecting a lot of techinical and theoretical topics on Asia's MMA future, especially on it's marketing strategy as well as the history of martial arts itself that has lived it's way through technological advancements and still be a strong and leading topic in today's society. Our venue for the Summit. On top the representatives mentioned on top, it seems that brother and sister of the legendary Bruce Lee will be delivering keynotes on the history of martial arts ( not sure in general or about Bruce) which will certainly be an entertaining session just because these two are probably the best people to be talking about it. To have a better look on the events that will be unfold throughout the conference here is the full agenda in which I will be attending too. 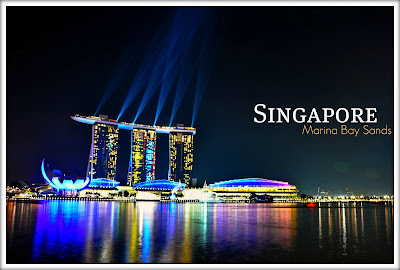 So two days later, I will be on a bus with some of my fellow MMA enthusiastic friends heading down to Singapore to attend this possibly largest summit for MMA to-date. 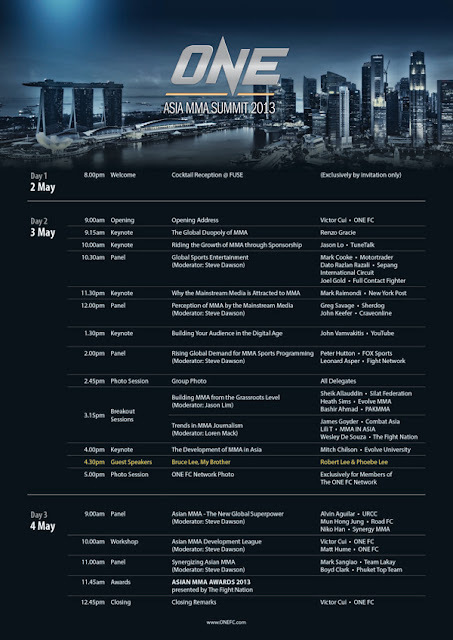 "If you are not going to be there you can always follow me on twitter or instagram (for visuals) @benjaminvai or track the hash tags #ONEFC #AsiaMMASummit as my friends as well possibly other members of the media and some twitterholic speakers will be dropping interesting developments throughout the summit :). " Though it's not some of the things I usually cover, it will do good taking a more formal approach to the events that I attend to stay tune! 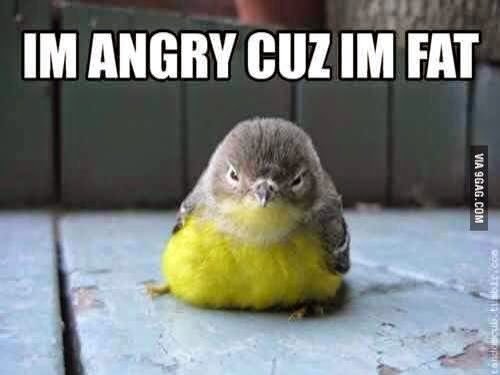 :) MMA Fighting!